What is a Vortex Mixer? Vortex mixers are one of the primary technologies for mixing laboratory samples in test tubes, well plates, or flasks. They use a fairly simple mechanism to agitate samples and encourage reactions or homogenization with high degrees of precision. Motorized drive shafts beneath the sample platform oscillate rapidly and transfer orbital motion to sample containers loaded into the mixer. This causes sample fluids to circulate and undergo turbulent flow, otherwise known as a vortex. This is a similar form of kinetic force to stirring, albeit without a component protruding into the sample container. This is preferential for many microbiology and life science applications with sensitive samples or high throughput operations. A typical stirrer is limited to mixing a single sample container at a time and cannot mix fluids in sealed flasks, which is often a prerequisite for mixing reagents of biochemical assays. 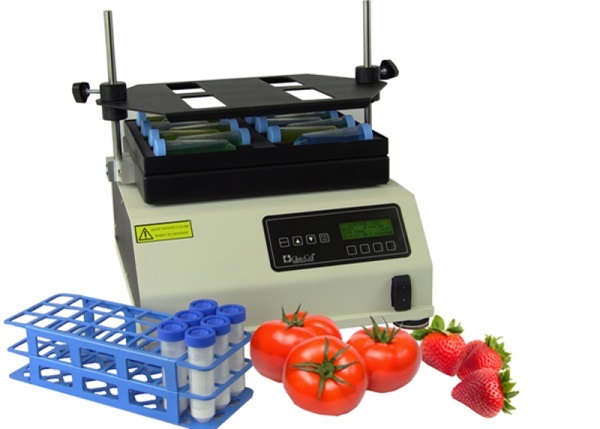 Vortex mixers, by contrast, are usually engineered with a minimum dual-plate format, enabling simultaneous mixing of multiple samples. The geometries of vortex mixers are incredibly varied, ranging from single test-tube touch mixers to large capacity designs. The touch vortex mixer from Glas-Col is engineered with a variable-speed motor that can be set to run continuously or to respond to applied pressure. Alternative designs may be subject to overloading when excessive pressure is applied to the rubber-cup, but Glas-Col’s Touch Vortexer is engineered with a permanent-magnet, variable speed motor. This provides enhanced durability during intensive periods of operation. Touch vortexing and single test-tube mixing are unsuitable for high throughput laboratory environments and caustic sample types. Higher capacity vortex mixers utilize a cartridge system capable of housing multiple sample containers at once. These are typically designed to facilitate a range of vessel types, from micro-centrifuge tubes to larger Erlenmeyer flasks. The swirling action of vortex mixers can be used to homogenize samples such as heterogeneous solutions, but this mixing action is limited with respect to vertical strata. Solutions mix horizontally around the axis of rotation which complicates the preparation of samples with constituent parts of disparate densities. Innovative vortex mixers overcome this challenge with an additional pulse functionality, which interrupts the orbital motion of the fluid to mix from bottom to top. Pulse rates of up to 80 pulses per minute (ppm) provide the most thorough mixing possible to ensure that immiscible fluids or difficult suspensions are suitably homogenized. Novel vortex mixers have also been designed within sterile incubators, to provide tight-control of a reaction’s thermal conditions throughout orbital mixing processes. The thermodynamic stability of complex biochemical products requires the utmost precision during processing. Glas-Col’s incubating vortex mixer boasts a broad speed range from 150 – 1200 rpm, across a temperature range of 15 – 50°C. You can read more about the performance of this product in our previous blog post: Vortex Mixer for Bacterial Protein Expressions. Glas-Col specializes in the development of high functionality laboratory equipment for a broad range of application areas. Our vortex mixers have been used for studies as varied as food contamination analysis and bacterial protein expressions. If you would like any more information, please do not hesitate to contact us.